Did anyone at Chapel on Monday morning notice how calm, cool and collected Danielle Rinnier appeared? There’s a backstory, one filled with a lot of preparation to mitigate the very subject of her talk – fear. 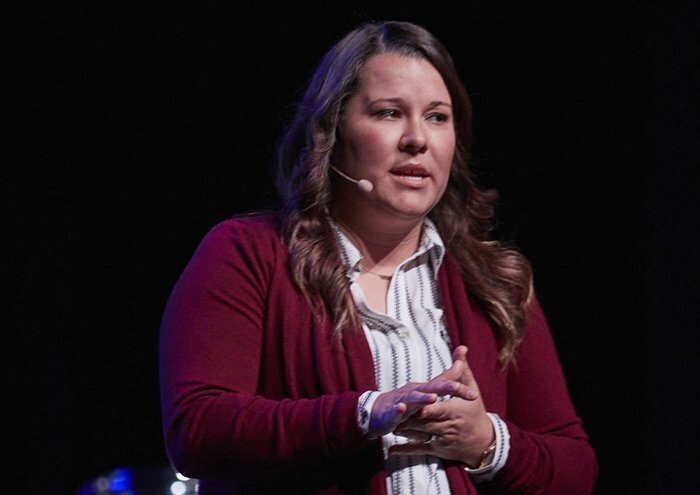 Rinnier, Grand Canyon University’s Director of Spiritual Life, was speaking to Chapel for the first time, and not because she was banging on the door of Dr. Tim Griffin, Pastor and Dean of Students, every day begging for the opportunity. Just the opposite. “It’s funny because I never wanted to speak in Chapel,” she said in her Student Life Building office later in the day. “Tim brought that up over the last couple of years, and every time I’m like, ‘No, no, no.’ And finally he really pushed me. Rinnier had experience speaking at The Gathering, a prayer service for students on Tuesday evenings in Antelope Gym. 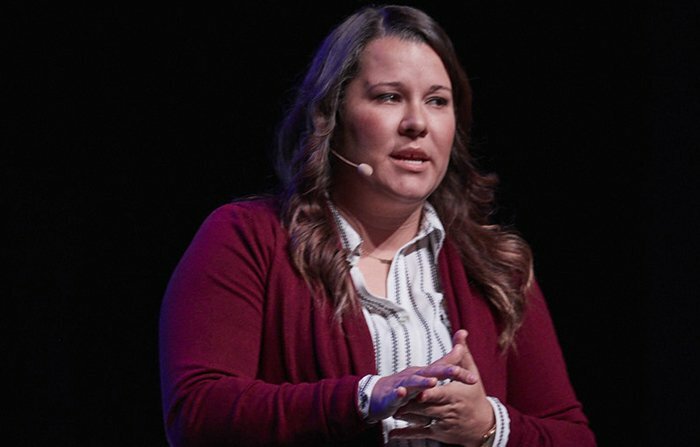 She was in student government in high school and as a student at GCU (she graduated in 2007), and she had spoken at graduations and similar large events. But this was the big boy. This was Chapel, before an audience of 5,000 in the Arena. If there’s a talk to fear, it’s this one. Rinnier followed a simple maxim: The only thing to fear is fear itself, and extensive preparation is the only way to lessen that fear. “I don’t know how other people prepare, but it’s a lot of time and energy and work,” she said. So there she was Sunday in the guest bedroom of her home, practicing her talk orally over and over – six times total. And then there she was Monday morning, never once referring to her notes during her 25-minute presentation, never looking fearful in the least. Rinnier has an easy-listen, down-to-earth speaking style, and the wisdom of Griffin’s gentle nudges were there for all to see and hear. But she had to feel ready. “Because then I know it and I’m more comfortable. It’s always kind of there if I have that moment and just go blank,” she said. Her topic is the type of thing that can make people’s minds go blank with fear. That’s why the Bible is filled with “Be not afraid” references, Rinnier pointed out. Years later, Joseph and Mary were on a long journey and lost track of their son. “Imagine if you lose your child. Imagine if your child is Jesus,” Rinnier said with effect. Even then, as soon as Mary found him in the temple, he quickly eased her fears. The first was when she was a senior at GCU and impulsively decided to end her relationship with her boyfriend, Andrew Rinnier. “What are you afraid of? If it’s supposed to work out, it will work out,” God told her. It worked out. God not so coincidentally put Andrew back in her life (rather than return to his native New Jersey after graduation, he got a job in Phoenix), they resumed the relationship, and they recently celebrated their ninth wedding anniversary with their two sons – Maddox, 3, and Levi, 2. Andrew also works at GCU. The other situation didn’t have such a happy ending, but Rinnier wanted to share it with her audience nonetheless. She told them she had a somewhat normal childhood despite her parents’ use of drugs and alcohol. But about five years ago, her father was forced to leave the home after continually bringing drugs there, and that led to a string of threats, stalkings, arrests and restraining orders. It came full circle this year when, just as students were moving out at the end of the academic year, she got a call from a local hospital: Her father, after spending much of those last five years on the streets, didn’t have long to live. She went to see him and remembers musing, “When I think of the father-daughter relationship, this is not how it’s supposed to look.” Three days later, he suffered a stroke and died, and her hope of a normal relationship with him died, too. She again turned to God, who helped her realize that worry and fear is useless in times of such distress. Rinnier wanted to provide that personal insight because she knew that sharing your fears might sound good on paper but doesn’t always enter our prayers. Rinnier made one big mistake in her talk: She was good. Too good. She shouldn’t be surprised if she’s asked to do this again. Does she want to? In other words, never fear. ● For a full replay of Chapel, including the music by the Chapel band, click here. ● The speaker at the next Chapel, scheduled for Dec. 4, is Tom Shrader of Redemption Church.